Pity and Love for a Homeland. My elder brother at Neo Tiew Village's coffeeshop. It is only photo we have of the place. Coined by Phoaw Yen Shan, a good friend of mine, Sayang Singapura is a reflective and imaginative exploration of Singapore. “Sayang” has the dual meaning of affection for and a pity, a reaction to the changed landscapes of Singapore. Such places include Queenstown where my mum grew up, the former Ama Keng Village where my dad grew up or Neo Tiew Village where I used to play around when I was a child which has turned into a military training ground. These places hold fond memories for my parents, friends and I that have changed over time, serving as an inspiration for the book. It is a whimsical take of my relationship with a rapidly changing homeland. 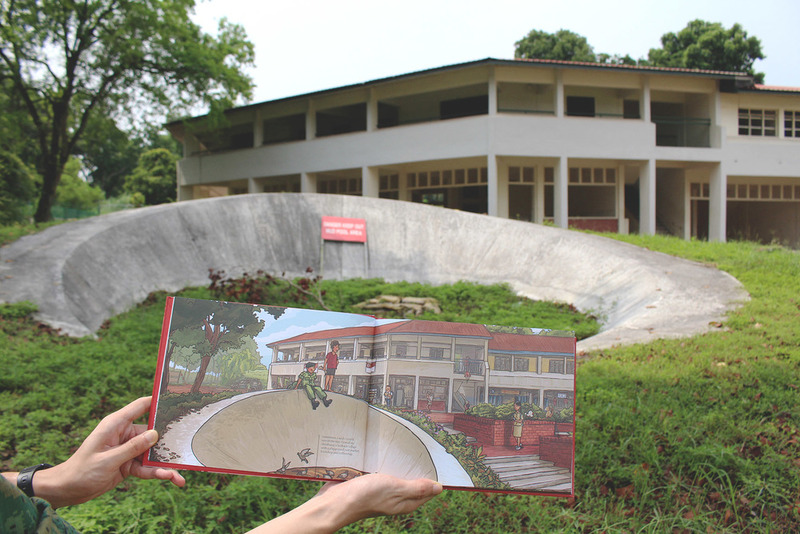 This is a recent revisit of one of the places in "Sayang Singapura" : Neo Tiew Estate with a panoramic illustration. Located along Piccadilly Road in Seletar, this kampong style canteen dates back to the 1960s when Seletar Camp boundaries goes right up to the canteen. The canteen served mainly British military personnel of RAF Seletar followed by local military personnel when the camp was handed over to SAF after the British withdrawal in 1971. Chong Pang Village was a former village located along Sembawang Road near the present-day Sembawang Shopping Centre and the former Canberra Gate entrance of the Naval Base. One of the iconic feature of the village was its roundabout where the Sultan Cinema was located. The village was cleared in the late 1980s - 1990s. Jalan Sendudok is one of the roads left from the former village. However when I was a child, my siblings and I used to play at this round-shaped "playgrond" and catch bees at the coffeeshop. My relatives and my mum runs the drinks stall, chicken rice and tze-char shop at the once bustling coffeeshop patronized by military personnel, tourists and local residents around the area. Geraldene Lowe, Singapore's oldest tour guide used to bring her tour group to Neo Tiew to buy drinks at the coffeeshop as well. Also known as Kopi Sua or Coffee Hill. The cemetery dates back to the 19th century and is the largest overseas Chinese cemetery outside China.The cemetery is the final resting place of many famous pioneers of Singapore. 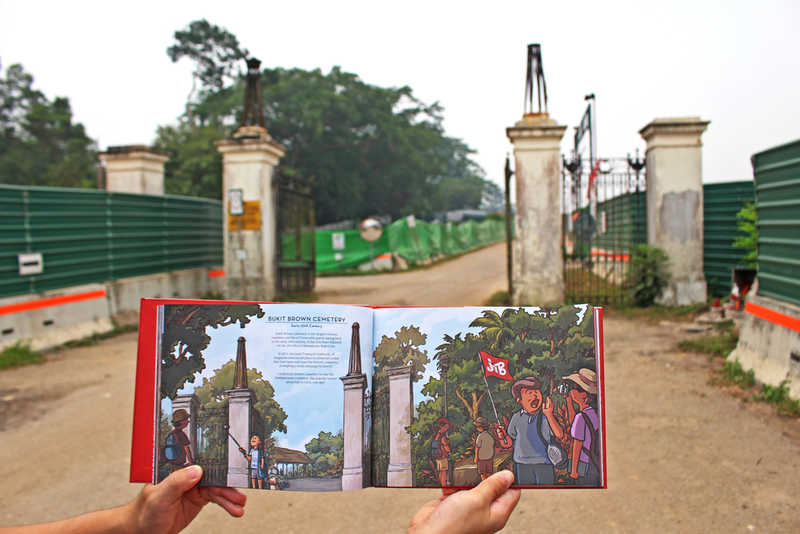 An iconic feature of the cemetery is the Lorong Halwa Gate. Since 2012, works have taken place to construct a road cutting across the historical cemetery. As a result, many graves have been exhumed and the gate has been moved as well. The cemetery has been listed by the World Monuments Fund and one of the top 100 sites to visit on Trip Advisor.